Tim Watters is an award winning photographer and filmmaker whose work has featured in National Geographic, The BBC, CNN, and various other news sources and print media. Tim started the organisation ‘Fair Projects’ in 2011 in order to provide NGOs with professional quality media at an affordable rate. In 2008 Tim began volunteering for Sea Shepherd, and today he has taken part in 10 campaigns in Antarctica, Australia, the Galapagos Islands, the South China Sea, Africa, Europe and Indonesia. 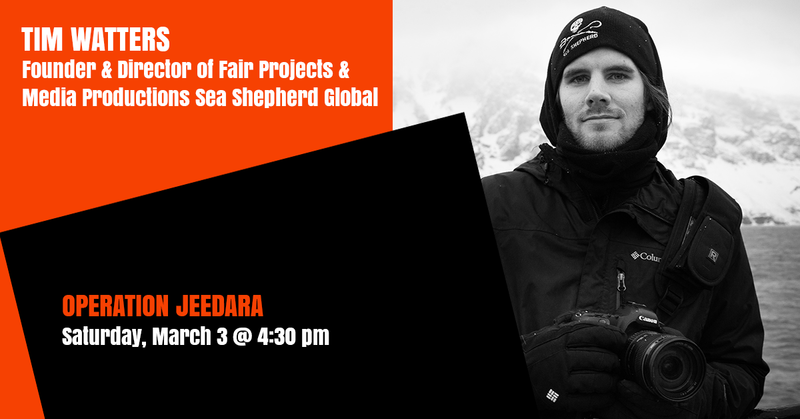 Today, Tim and his partner Eliza head the Sea Shepherd Global media production’s department. In Australia, Tim has produced documentaries on the fight against the worlds largest gas hub in the Kimberley, the opposition to the controversial shark cull in Western Australia, and the resistance to BP’s plans to drill for oil in The Great Australian Bight. Each of these campaigns resulted in a success for Sea Shepherd and their campaign goals. Through his work, Tim aims to produce and distribute engaging and creative media that will assist in educating the general public about issues facing us and our planet.